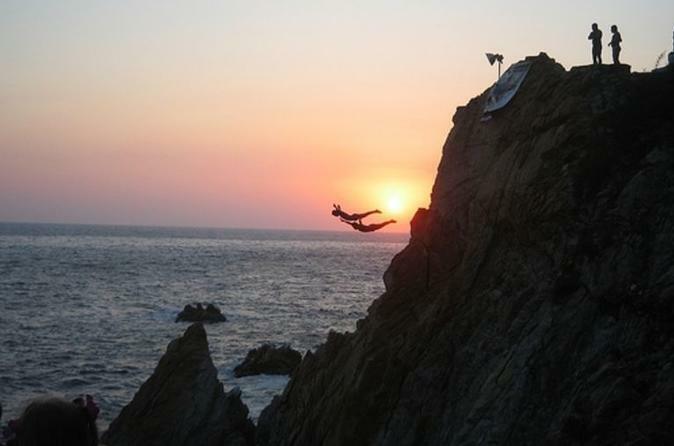 If you come to Acapulco and you do not see the High Cliff Divers you have not been to Acapulco. The tradition of cliff diving goes back to 1934, when two neighbors of Acapulco challenged themselves to show their courage and decided to measure their forces by throwing themselves into the sea from the top of a cliff. This Acapulco tradition takes place every night from La Quebrada's daunting clifftops in Old Acapulco. Start right at the lobby of your hotel where your friendly and knowledgeable driver-guide punctually picks you up for your adventure. Drive to the west cost of the city and out of the Bay of Acapulco to the "El Mirador”. Along the way your guide tells you everything there is to know about the city of Acapulco and the show you are about to witness. Have a very nice table with a great view reserved so you can admire the world renown High Cliff Divers of La Quebrada. Two domestic drinks (cocktails, wine or beers) are included.